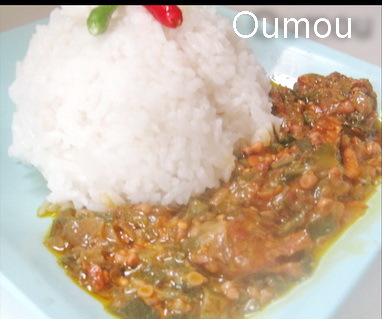 Okra Soup is one of the most famous dishes in Africa. Many variations of this soup can be found throughout Africa (Nigerian, Liberian, Ghanaian and many other). It is usually served with rice or Fufu. It can be made with beef, lamb, fish or any meat. For this recipe I added both beef and fish. This recipe calls for red palm oil but if you can get it you can substitute with peanut oil. If you are using fresh okra, wash and cut them finely. Then reserve. In a deep pot put the beef or your chosen meat (Lamb, mutton or any meat). Add in the fish and 2 cups of water. Bring that to boil for 10 to 15minutes or until the fish is cooked. Remove the fish from the pot and let it cool down. Then remove it bones and reserve. Add the okra with another cup of water and let simmer for 15 minutes. Add the onions, the palm oil and the bouillon cubes. Then add chilies and salt. To finish return the fish in the pot and cook the sauce 15 minutes or more (there must be no water remaining). Make sure to stir the sauce regularly in order to avoid the sauce to burned. Serve with rice or Fufu and enjoy.